This is Copper, the resident fox at Sweetbriar Nature Center. He came to Sweetbriar as a young kit about four years ago. He’d been hit by a car and while the docs were examining him they discovered that besides his injuries, Copper had apparently been born with some birth defects. 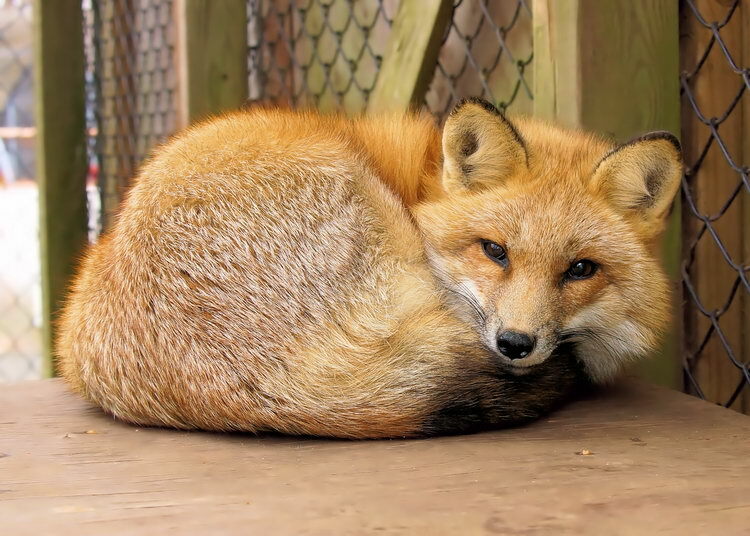 This little guy – all foxes are little – is blind in one eye and very nearly so in the other. He’s also missing one of his rear paws, although he gets around so well that it almost goes unnoticed. 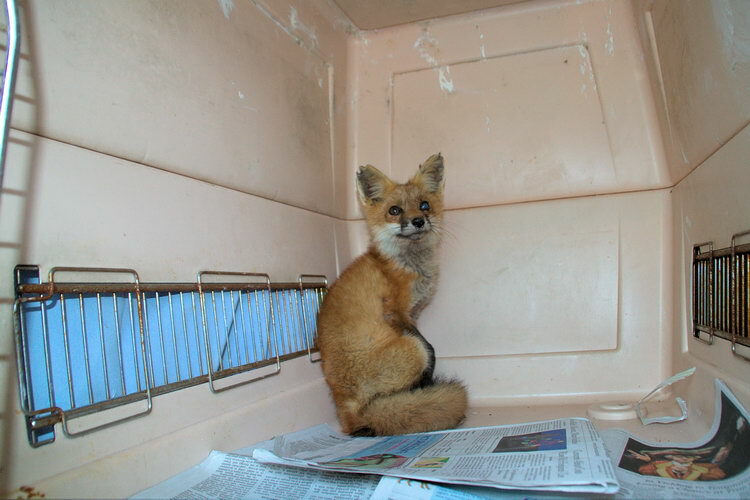 Copper recovered from his injuries but his birth defects made him an unsuitable candidate for reintroduction to the wild. A blind fox cannot hunt. Or avoid cars for that matter. 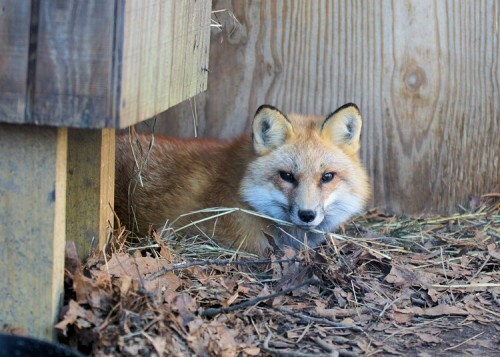 So instead, Copper spends his days in an enclosure built specifically for him. That’s not only great for Copper but it allows visitors at Sweetbriar to have a good look at these very secretive critters. These guys are as shy as they are beautiful. I’ve been playing in the woods for over 45 years and I could count up all of my fox sightings without even starting on my toes. Now I can visit with Copper anytime. Just look at that face. Is that the face of a happy canine or what? 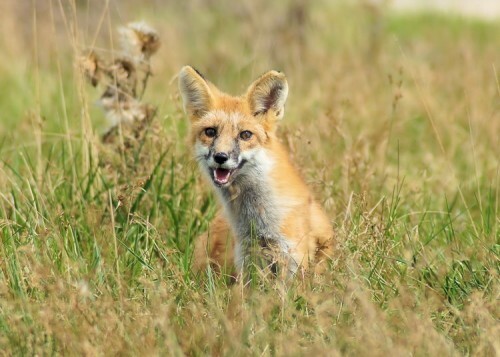 This little vixen is relaxing in the tall grass after being released at the Timber Point Golf Course in Great River. A real diamond in the rough. Isn’t she a beauty? These are her first few moments of freedom after spending over two months convalescing at Sweetbriar Nature Center. She was rescued here back at the end of June and now she’s back home. My friend Janine is one of the wildlife rehabilitators at Sweetbriar and she invited me to photograph the release of this young Red Fox. Thanks again, Janine. This is a photo op that doesn’t come along very often. 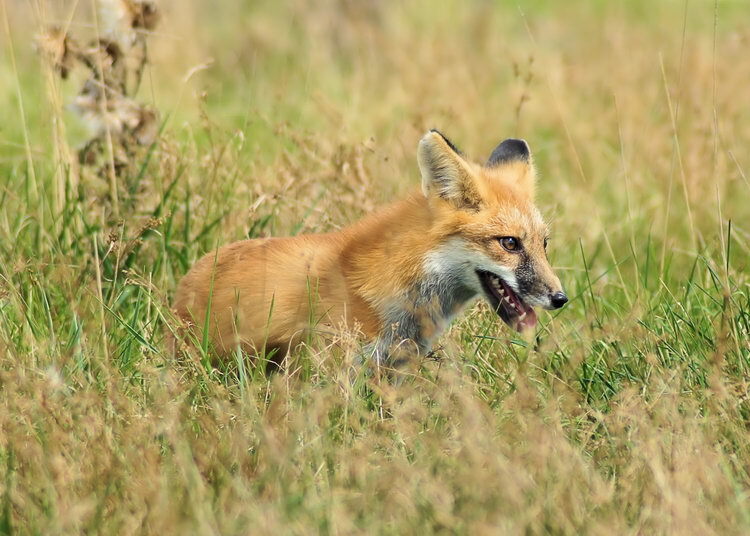 Janine is the rehab tech that responded when Sweetbriar got a call concerning an ailing fox seen on the golf course. An exam back at Sweetbriar revealed that the fox was a female kit – that means puppy to you and me – and she was only about two or three months old, tops. Possibly the victim of a hawk attack, she had puncture wounds and scrapes all over her body. The little lady wasn’t using her left foreleg and one of her eyes was completely clouded over due to an infection. She was also very underweight and dehydrated and covered with ticks. I saw her within days of her rescue. She was not a pretty sight and this was after the Sweetbriar crew had already cleaned her up. It was heartbreaking to see this tiny girl, dwarfed inside a medium sized dog carrier, favoring her injured leg and obviously blind in that milky eye. It was her not her best day. She was taken to Commack Animal Emergency Hospital for a checkup. The folks there do a lot of pro bono work for Sweetbriar but sometimes they work it out in trade. In this case, Janine had to take three baby squirrels off their hands. A fair trade, I think. The vets x-rayed the fox’s leg and had a look at her eye. Luckily, there were no broken bones and with medication the eye would mend. 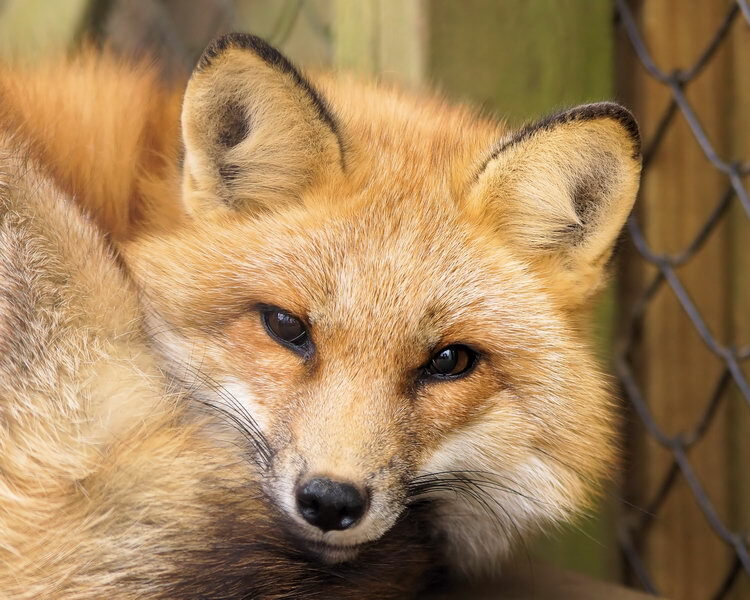 After a week or so of isolation, during which she received eye medication and had her wounds cleansed daily, she was introduced to Sweetbriar’s resident fox. They hit it off just great and became fast friends. Unfortunately, the resident fox can never be released because his injuries are too severe to allow him to survive in the wild. He’s blind in one eye and nearly completely so in the other. He’s also missing one of his rear feet. 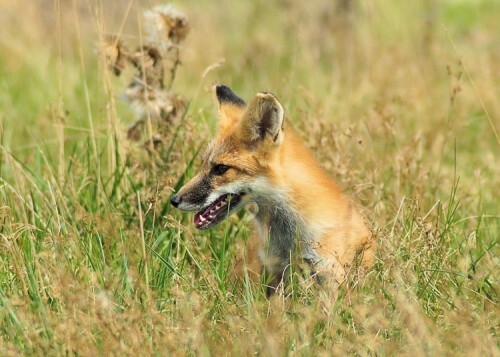 I don’t know what happened to him but, obviously, being a fox is no picnic. On a happier note, our heroine only needed a few more weeks of eye drops and then some time to get her strength and weight back. I make it sound easy but but wrangling a wild animal and giving it eye drops cannot be an easy trick. If any of you have ever tried to do this with a pet at home, you know what I’m talking about. Try that with a critter that has no reason to trust you or any humans. 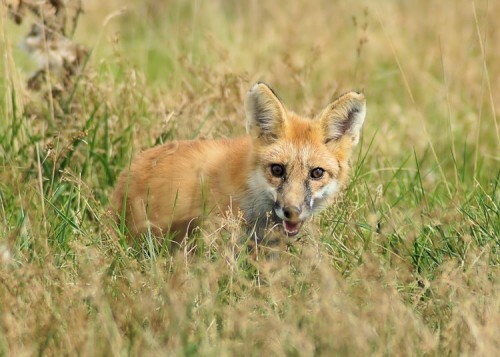 In fact, it’s likely that the only human encounters this fox has ever had probably involved dodging golf balls. Janine admits that her work can be difficult but in the same breath she also points out how rewarding it is. Then it was “Out the door”, “See ya later alligator”, and my mother’s favorite, “Here’s your hat and where’s your hurry?” It was time for her to leave Sweetbriar and get back to where she belonged. Of all the times I had seen this young lady, she was never more beautiful than she was on the day of her release. She was a free creature in her natural element and that is a truly wonderful thing to see. I feel fortunate to have witnessed it. I hope you enjoy the photos because I really enjoyed taking them.